~ The wonky star table runner is coming along nicely. The top is finished and I'm working on the backing...a pieced back this time! In fact, I'm not sure if I'm going to like the front or back more, maybe we'll just call it reversible! While I prefer to take photos outside, it is a super blustery day today therefore indoor photos will have to do for this week! ~ HST pillows, two down, one to go. I'm asking for your help....I can't decide which of the remaining 3 blocks to use for the third cushion for our bed, so in the comments please vote 1, 2, or 3. :) The other two will still be used for something else, just not sure what yet. ~ After the sad outcome with my Little Apples fabric chair pillow from last week, take two on the Perfectly Portable Cushion pattern is in the works. I am going to try it without piping this time, as round 1 with piping for me was a miserable failure, and rather than a zipper I am going to do a velcro closure around the back of the cushion, hopefully as invisibly as possible! The fabric I am going to use ~ Genevieve flowers on brown by Henry Glass Fabrics, on clearance at the fabric store. Can't get away from that blue/red combo! That's about it from me for this week. 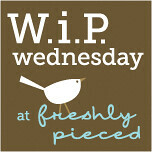 Be sure to click the link below and visit the weekly W.I.P. roundup over at Freshly Pieced! I'm having a hard time committing to just one--they are all so cool. So my choice is...Number 2. But really you couldn't go wrong with any of them. I kind of like pillow #3 with the other two that use hst. They are all lovely tho. And your table runner - looks fantastic! Great quilting & can't wait to see it done! I really like 3 as well, as I think it goes with the other pillows more than the other 2 - but they are all beautiful blocks!! I love 3 pillows. full beautiful. So tough!! But I love 2 the best, followed immediately by 3 :) I love your runner - in fact, I've been thinking about doing a similar one for the holidays! Love the pieced back you're working up so far, too! My first choice would be #2, but I seriously think all three are great. Love the table runner too. Your table runner looks great, as you say, reversible. I love the back. For pillow, my first choice would be 2, they're all so pretty tho. Are you only putting one pillow on your bed or are you choosing one to go with the others shown in your post? If it's the latter, I choose #3. Beautiful colors and awesome quilting! For the pillows, I like them all, but if I were voting, I'd vote for #2, because of the tiny-ness of its stars - really cute! I'm totally sold on #2. But I'm biased, because I love stars. All of them are really great though. I just discovered your blog through Freshly Pieced and I love it! Just became a follower. Really like your runner and my vote is definitely #2... gotta love those tiny stars! Your blocks are awesome! I'd go with the flying geese for the other pillow, so #1! I love that blue/red combo. Nice work on everything! You should go with block number two its just so pretty. Your table runner is fantastic! I hope my piecing looks that good someday! I really like number 3, but your baby wonky stars are also very cute. oh my goodness, so much to look at here today! i really just love it all! I love your HST blocks! At this moment, my favorite is number 1. Lovely! ALL of these projects are stunning!